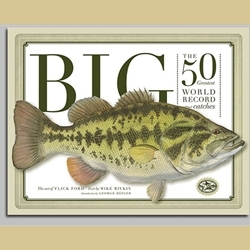 BIG: The 50 Greatest World Record Catches is the first-ever illustrated book about the top 50 world record game fish catches. Flick Ford—acclaimed—“Audubon” painter of fish—has created spectacular reconstructions of actual world record catches, many never-before-seen in living color. Author Mike Rivkin, International Game Fish Association’s historian, tells the stories behind each of the 50 top catches. Who, what, where, bait, boat, tackle plus the history of record keeping, conservation, IGFA certification and summary of endangered species.